KevGar’s first Listener in October 2012 had Wittgenstein, and more especially his left hand, as its theme. 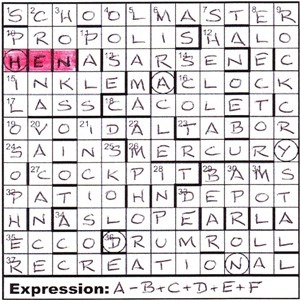 This one looked totally different, with seven clues that were mathematical expressions, and seven that contained an extra word whose initials meant something. The mathematical clues used the letters A–F, which were the first six numbers in a series defined by the initial letters of the extra words. My first pass through the clues wasn’t particularly earth-shattering with only a dozen being solved. However, the downs gave me ·CH··L····E·, and it didn’t take me long to speculate that SCHOOLMASTER was the answer to 1ac A+B+C+D+E. I also had extra words ‘shoddy’ and ‘uerthane’ from 12ac and 32ac. Now… if my memory of a whole slew of puzzles five years ago had been better, 1ac might have given me an inkling of the theme and — did I mention the five cells that were circled in the grid? — what to put in the five cells that were circled in the grid. Unfortunately, my memory is becoming less retentive as the years go by, and ‘schoolmaster’ didn’t ring any bells (no pun intended). Soon after, I got CACOLET at 18ac with its extra word ‘queen and it looked like the first series, A–F, was going to be squares. The garden feature at 9dn Pointless garden feature includes coloured engraving on last broken stone (11, two words) was ROCKERY – E (pointless) including C (coloured) + LAST* giving ROCK CRYSTAL. It also looked as though 6dn was MIRACLE, 10dn PHILOSOPHER and 37ac RECREATIONAL, and the word spelt out by the circled squares was… oh! it’s Haydn again! I do recall that he had a long list of symphonies, many of them with nicknames, and a quick calculation of 1ac gave 55, the number of the Schoolmaster symphony. Finally, a search for a further symphony (3 letters). It didn’t take long to find The HEN in row 3, symphony no. 83. Using all six letters A—F in order, we didn’t need to use “all four basic arithmetic operations”, but only + and – , to make 83: A – B + C + D + E + F, ie 1 – 4 + 9 + 16 + 25 + 36. The title becomes A Birthday 94… A Birthday Surprise. 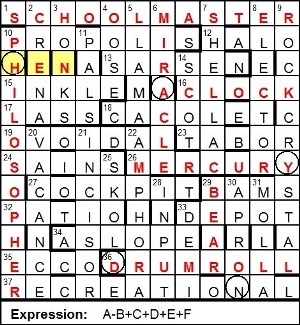 Thanks to KevGar for an enjoyable puzzle, and farewell again to Haydn for another five years (at least). This entry was posted on 25 April 2014 at 4:00 pm	and is filed under Solving Blogs. You can follow any responses to this entry through the RSS 2.0 feed. You can leave a response, or trackback from your own site.